Signing up for a welding program usually means finding the nearest school to home. However, some students are willing to travel across the country to attend one of several prominent programs run privately. While that sounds like the ideal choice, adult vocational centers and local community/junior colleges offer very similar training and access to equipment for a fraction of the cost. Several pages are devoted to the welding department (if the school has one), listing degrees and certificates available. Read the course descriptions, and see which classes are required for graduation. If you don't have an A.S. or A.A. degree already, you may decide to earn a certificate in welding instead. That will save you the time of having to complete the extra 30 units of general ed requirements. Remember, employers are more interested in your welding skills than your academic pedigree, so the certificate - and more importantly, a 3 or 4-G certification by a certified welding inspector - will likely get you hired as a welder. 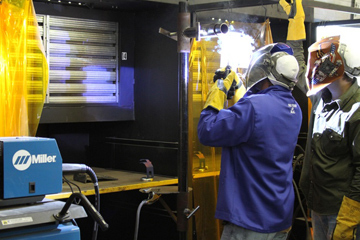 A significant advantage of a junior college over a trade school is that you can take classes outside of the welding department that will be useful in the profession. This includes Autocad drafting, metal arts, automotive technology, chemistry and agricultural mechanics. You can also use any course credits you earn towards an advanced degree, should you decide to become a welding engineer in the years ahead. In the short term, an A.S. degree in welding technology may give you an edge when it comes time for a promotion at work. If it's worth its salt, any welding school should also provide a free certification service administered by a certified welding inspector. This is essential, because getting certified privately can cost several hundred dollars. When enrolling at community colleges, keep in mind that even if a class closes during the early registration period, you can still get in by showing up on the first day. (Or you can monitor the registration website to see if a seat opens up prior to the start of the semester.) There's no guarantee if you wait till the last minute, however, so sign up as early as you can and pay your fees. If you're a low-income student, check with the school's financial aid department about a tuition waiver (easily available at most junior colleges), or scholarship/loan programs (at private schools). Always be wary of assuming a large loan obligation; it should be your last resort. See Schools and Training for more info on schools. Apprenticeship programs for pipefitters, boilermakers, plumbers, iron workers, sheetmetal and steelworkers, or other related occupations are (in most cases) jointly administered by labor unions and employers. While apprentices learn their jobs in the field and get paid like other employees, federal and state government agencies provide funding for classroom training. Typically an apprentice attends a class one night each week for four or five years. After completing the coursework and putting in the requisite hours on the job, the employee is certified as a journeyman. To sign up for or learn more about apprenticeship, contact the nearest local chapter of the union that operates the program you'd like to join. (You can find some of the national union headquarters listed on our Schools and Training page.) Some programs invite you to take a test (covering basic math and hand tool use), and after passing it, your name will be placed on a waiting list for the next apprenticeship opening. Other unions hold in-person interviews with prospective apprentices. Generally, only applicants between the ages of 18 and 35 are considered. If you can't wait for your name to be called, employment within the U.S. Armed Forces provides additional paid-while-you-learn options. All three branches - Army, Navy and AirForce - offer career paths for anyone aged 18-35 interested in pursuing welding, fabricating and steelwork. For direct links to specific occupations, check the Military category on our Jobs page. If you have any website suggestions or concerns, email welder [at] thecityedition [dot] com.